Rio Claro: Univesidade Estadual Paulista (UNESP); meeting with A. Fidelis & students (Luis, Talita, etc.). Visiting the Itirapina experimental fires [photo C]. Talk: “Fire, traits, and biodiversity: a global perspective”. 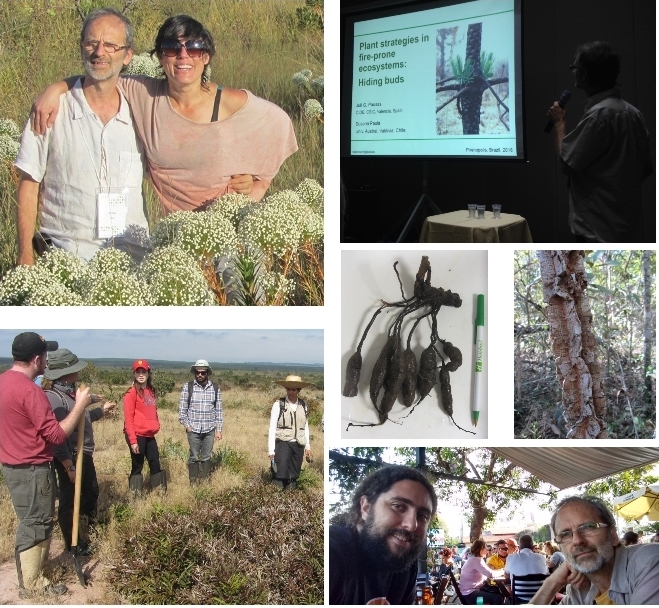 Photos: A (top left): Susana Paula, Ericaulaceae and myself; B (top right) : my talk in Pirenópolis; C (bottom left): A. Fidelis and her students in front of an ‘underground tree’. 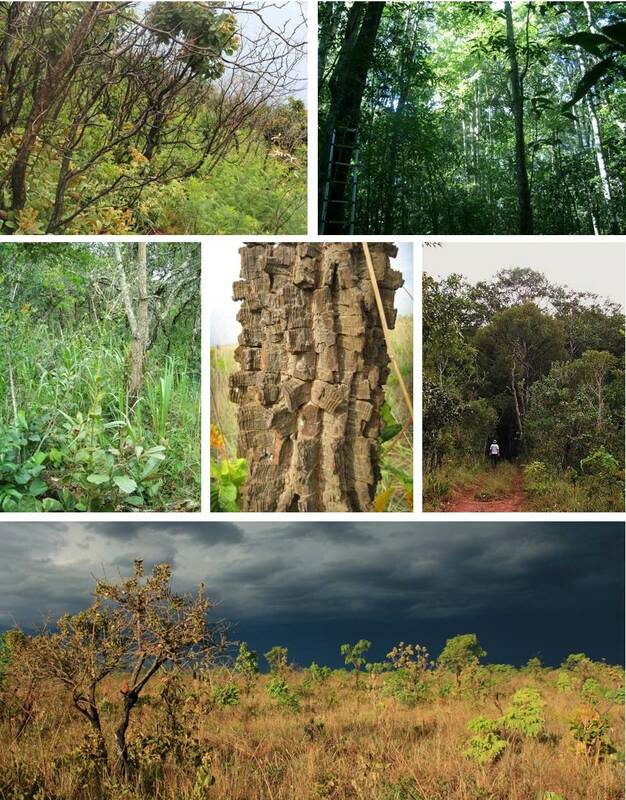 D (center): Xylopodium with tuberous roots in Aldama (Appezzato-da-Glória lab); E (middle right): tree with a corky bark in the cerrado of the Jardim Botánico (Brasilia); E (bottom right): Having a drink with Vinicius Dantas in Campinas. March 20, 2015: “Flammability as en ecological and evolutionary driver“, 15:00 h Bilogia, Universidade Estatual de Campinas (UNICAMP), SP. 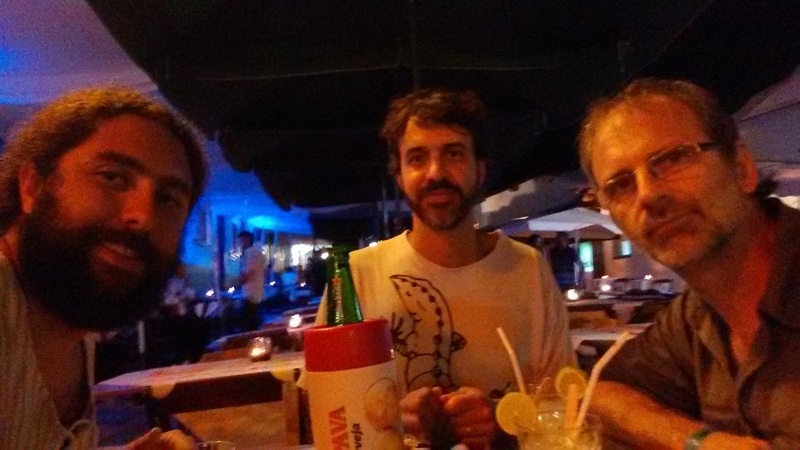 Vinicius Dantas (University of Campinas), Marcelo Simon (EMBRAPA, Brasilia) and myself having a caipirinha in Pirenópolis. “Cerrado” are neotropical savannas from Brazil. As in most savannas, fire is very frequent in cerrado, and fires has been occurring in these ecosystems during the last few millions years. 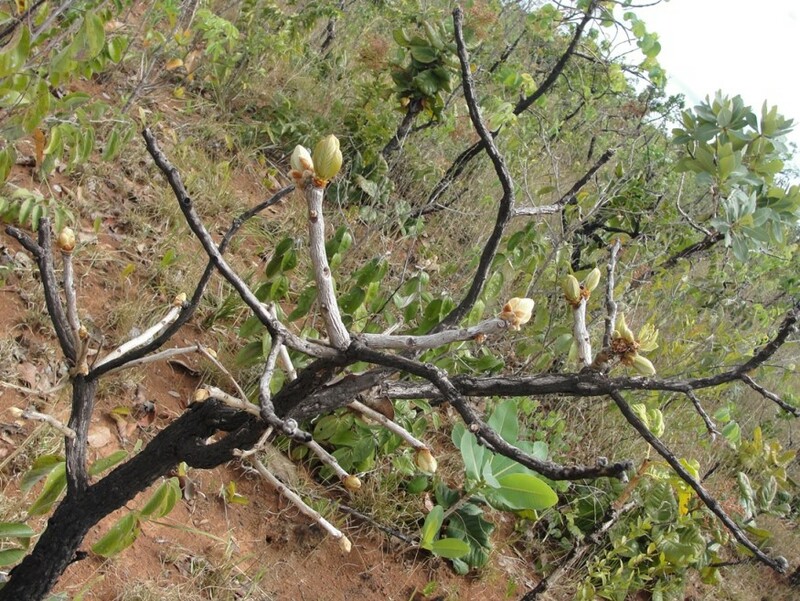 Consequently, cerrado communities are strongly filtered by fire and are composed by species capable of succeed under frequent fires (e.g., resprouters, with very thick bark, etc). A recent study  comparing zones with different fire regimes (annual fires, biennial fires, and protected from fires) within the cerrado (in Emas National Park) suggests that most plant trait variability is found within species (intraspecific) and little trait variability is due to changes in species composition (interspecific) between fire regimes. 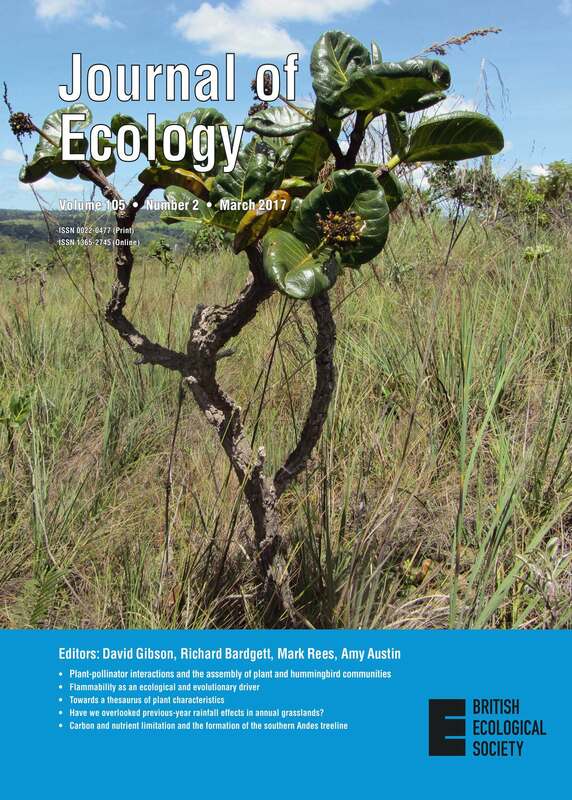 Thus, at community scale, fire act more as an filter, preventing some of the species from outside cerrado to colonize the cerrado (e.g., from nearby non-flammable forests), than as an internal factor structuring species composition in the already filtered cerrado communities with different fire regimes. However, fire acts as an important factor generating intraspeciﬁc variability. These results support the hypothesis of the prominent importance of intraspeciﬁc variability in strongly ﬁre-ﬁltered communities [2,3]. 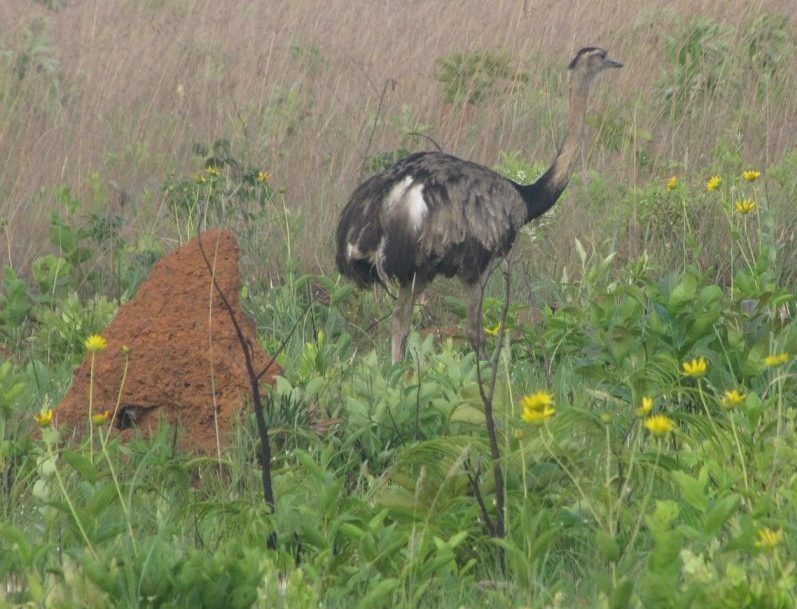 Figure: The rhea (emas in Portuguese; Rhea americana) are a flightless birds that give the name to the Emas National Park (Parque Nacional das Emas), a World Natural Heritage site located in the Brazilian Central Plateau (Photo: JG Pausas, 2009, during the field sampling ).